Hobnox Audiotool is seriously addictive. Time was that it was impressive enough that you could make music on a computer at all - let alone on the internet. However, this is now eminently possible; online music-making in 2009 takes a variety of forms, and it doesn't have to cost anything beyond what you're paying for your broadband connection. If you want to collaborate with others, there are various solutions that can be downloaded and installed on your Mac or PC. Other sites offer in-browser mixing and recording apps that enable you to access other people's tunes or create your own. You can even set about remixing commercially-released music - again, from within your web browser. We've picked out eight of the most notable online music-making options. Read up on them here, then go and give them a try. Designed specifically for guitarists, Riffworks features a loop-based workflow that enables you to build up songs quickly. The good news is that the T4 version can be downloaded for free, and the even better news is that this enables you to collaborate with up to three other players online. You can then post your finished tracks on the RiffWorld website. 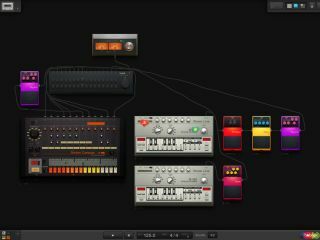 There are loads of one-trick Flash-based music-making toys on the internet, but Audiotool looks and feels like something you'd like to spend a bit of time with. It features emulations of classic Roland synth/groovebox hardware, plus a mixer to plug them into and a selection of stompboxes that you can use to process your sounds. Fire it up and see a five-minute tinker turn into a multi-hour production session. Network, collaborate and discover are Indaba's watchwords, and they sum up the site pretty well. You can make contact with musicians from around the world, create music with them in a web-based app, and listen to other people's music. There are also remix contests - stem files of songs can be downloaded and you can then set about reworking them. With the emphasis on remixing, JamGlue enables its members to upload music files and then arrange them in a DAW-style browser-based app (you can record into this, too). This isn't the end of the story, though: you can also make use of all the other audio material on the site, and go to work on other people's mixes. Predictably, there are strong community elements, too. As well as offering plug-ins that enable you to work with others via your existing DAW, digitalmusician.net also has this standalone 16-track recording app for download. It's available to anyone with an account on the website (you can sign up for a free variant) and enables both offline and online collaboration. Webcam and talkback support mean that you can see and chat to your buddies, too. If your dream is to remix commercially released tracks, YourSpins gives you a quick and easy way of doing it in your browser. Select from a list of artists, pick one of their songs and you can then work your magic on it via an onscreen mixer. This lets you adjust levels and bring in alternative parts. Finished remixes can be saved and posted on your own profile page. The focus here is very much on playing with other people - sign up for a free trial and you can download the cross-platform eJamming AUDiio software application. Open this and you can start playing with other members, with the Jam Mode promising near-zero latency collaboration. There's also the Virtual Recording Studio Mode, which lets you work on an 'add-a-track' basis, and you can mix sessions down to WAV files. Here's eJamming being demoed by, err, Smashmouth. It's a more techy system than many of the others on our list, but Ninjam is an online, almost real-time collaboration option that many people have had a lot of success with. Some reading-up will be required if you want to get started, but if you want to give it a try, you might also like to download the Reaper DAW for evaluation, as this gives you direct access to the Ninjam servers.